Japan's growing love for cheese will continue, presenting an opportunity for U.S. dairy exporters to more than triple sales over 10 years if a new U.S.-Japan trade agreement is negotiated, according to a U.S. Dairy Export Council study. Conversely, "U.S. annual cheese exports to Japan could fall by 80 percent" in 10 years if there is no trade deal between the two countries. Under that scenario, New Zealand, Australia and the European Union would seize the competitive advantage with their existing trade agreements, tilting the playing field. "Japan is the second largest net importer of cheese in the world, after the UK, and imported $1.163 billion in cheese in 2017. 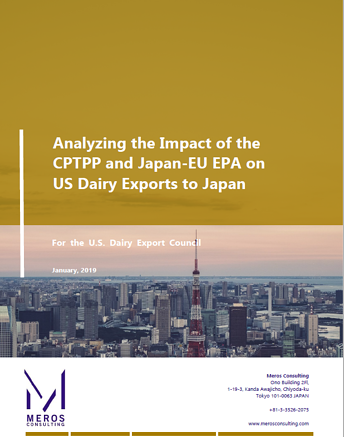 Since Japan’s two largest dairy suppliers, Australia and New Zealand, have limited capacity to increase their supply, Japan has expanded imports, especially from the U.S. and EU. "Although the population in Japan is shrinking by 0.4 percent per annum, the strong per capita consumption growth of 4.0 percent per annum is more than making up for the depopulation. Japan’s decreasing domestic cheese production is also resulting in a strong opportunity for exporting countries..."
"If the U.S. has the same market access as its competitors," the report said, "U.S. (cheese) share could grow from 13 percent in 2017 to 24 percent in 2027 and U.S. cheese export value to Japan could show a 3.3-fold expansion." "The combination of more need, and more demand and less being produced domestically (in Japan) creates a real opportunity for us," Vilsack told Agri-Talk, a syndicated radio show for rural America that airs on more than 100 stations. "But we're not going to sell it if we can't sell it at the same level and the same price as our competitors." Hear Agri-Talk radio comments. Click orange arrow, upper left. Watch RFD-TV interview. Click white arrow, lower left. A new free-trade agreement between the United States and Japan would be welcome news for U.S. dairy farmers struggling to cope with low milk prices. "U.S. dairy farmers are facing economic hardships, and expanding opportunities overseas is the best way to counter that," said National Milk Producers Federation (NMPF) President and CEO Jim Mulhern said in a news release. 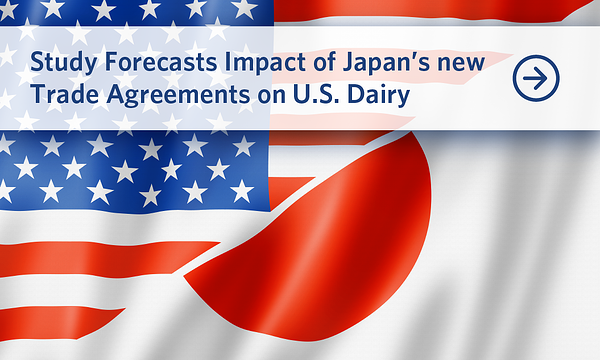 "A trade deal with Japan that significantly expands dairy access would make 2019 a brighter year."